Standing 140 metres high, the observation wheel – dubbed ‘The Whey Aye’ in celebration of its location – will be five metres taller than the London Eye. The project would see more than £100m invested in the city and up to 550 jobs created. 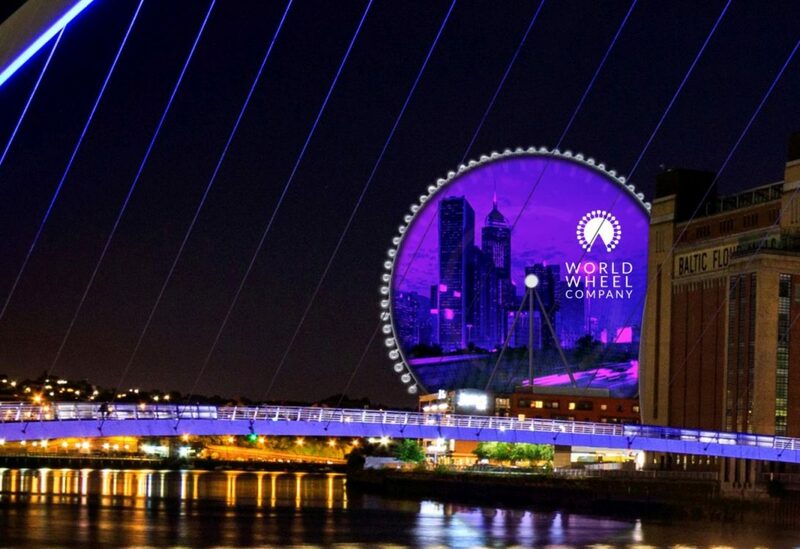 The wheel will also have a world-record breaking 10,000 sq m LED digital screen as its centre piece, which will be used to communicate information about local culture and events as well as social media content and advertising. Such is the nature and scale of the project, it is has already gained endorsements from Newcastle and England football legend, Alan Shearer, and prominent North East businessman and co-founder of accountancy software company The Sage Group, Graham Wylie. World Wheel Company chief marketing officer, Nigel Hartley, said: “Brand8 PR is an ideal partner for us due to its wide-ranging successful experience in property, construction, retail, leisure, hospitality and destination marketing. It is proposed that the wheel is built at the east end of the Quayside on the location of the former Spillers’ Flour Mill, which was demolished in 2011 and has lain vacant since. The plans include a pedestrianised experience featuring premium bars and restaurants and a world-leading 9,000 sq m visitor attraction called the Giants of the North Experience. Featuring cutting-edge virtual mixed reality and interactive technology, the attraction will hail the achievements of the region’s famous creative and sporting individuals, and the collective giants of North East industry including ship builders and the mining community. Along with the Giants of the North Experience, the plans will deliver a family entertainment centre and a multi-purpose play and sports complex, with covered five-a-side pitches and tennis courts, as well as a state-of-the-art virtual golf club. World Wheel Company has built and operated giant observation wheels and family entertainment centres around the world. These include 120 metre and 90 metre wheels in Suzhou, China, and Tbilisi, Georgia, respectively, and more than 20 family entertainment centres across the globe. With its head office in Hong Kong, China, World Wheel Company has established a base in Newcastle on Leazes Park Road, from where the design, construction and operation of the new developments on the Quayside will be managed. A detailed planning application relating to the wheel and visitor attractions is due to be submitted to Newcastle City Council later this year by World Wheel Company. According to the World Wheel Company, the wheel will offer 30-minute ‘flights’ and there are plans to accommodate more than 800,000 visitors in its first year. The entire development will only take 18 to 24 months to build, once planning has been formally approved. Brand8 PR managing director, Rob Smith, said: “This one of the most exciting high profile investment and regeneration projects in the UK, so we are very pleased to be working with World Wheel Company to help deliver it.